Getting a good USB wireless adapter to work with Linux used to be a problem but less so now with many available. It is the chipset of a WiFi dongle that makes it compatible with Linux. Popular chipsets include the Ralink 3070, Atheros AR9271, and Realtek 8187. Panda makes many good wireless dongles including the PAU09. It has two 5dBi antennas to get good range and comes with a USB extender if needed. A big plus is its Kali Linux compatible and can go into Monitor Mode. The PAU09 is a dual Band 2.4Ghz/5Ghz adapter and uses the Ralink RT5572 Chipset. The one downside is no 802.11ac support, as it is a 802.11n unit. Still its low cost, good range, and wide compatibility make it a good Linux USB adapter. The Alfa AWUS036ACH is a Wireless-AC unit built for fast WiFi speeds and distance. It comes with two large antennas that greatly improves a wireless signal. It uses the RTL8812AU Chipset which Kali Linux released Drivers for. This is good new for anyone wanting to use the newer 802.11ac WiFi protocols with Linux. During our test it worked well with some impressive wireless speeds, 213Mbps Download, and 21Mbps Upload. Alfa USB adapters are widely used in the Pen Testing community for their strong Chipsets, Linux compatibly, and screw on antennas that can be easily changed out for larger ones. The Panda PAU05 is a small Wireless-N USB dongle that works with many operating systems. It is a small dongle so the range is not the best and it only works in the 2.4 GHz range with 802.11n. 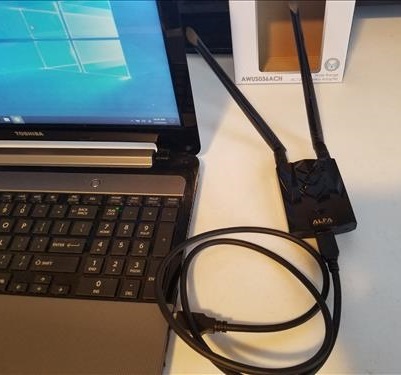 While not the fastest or longest range dongle its ability to work with many operating systems make it a good low cost choice for a Linux USB WiFI dongle. UPDATE: The TL-WN722N chipset has changed with the new version 2. 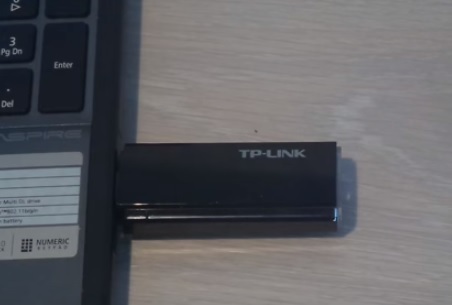 The TP-LINK TL-WN722N is used widely in the Pen testing Kali Linux community. It works with the aircrack-ng suite and is able to go into monitor mode for testing a wireless network security. A 4dBi External Antenna gives it better range than many smaller dongles. The TP-LINK Archer T4U is a dual band 802.11ac USB adapter. It uses the Realtek RTL8812AU chipset which many have had good results getting 802.11ac in the 5GHz range working with Linux. Good 802.11ac USB dongles have been slow to come about and often require some setup for the drivers. If you are looking for a easy setup than going with a known working wireless-N dongle would be better. When looking for an adapter to work work Linux be sure to look at the chipset the adapter uses and if the manufacture has changed it. While not common some manufactures have been known to change a adapter chipset with new versions. As always be sure to read the reviews on Amazon or elsewhere to be sure an adapter is a good fit for you and your setup. A dongle with a large external antenna will have better range, the frequency can also matter. Wireless dongles that transmit in the older 2.4 GHz frequency can transmit a signal better than the new 5 GHz band. Radio waves can travel better on lower frequencies than higher frequencies giving the lower 2.4 GHz better range than 5 GHz. 5 GHz was opened up to WiFi in 2013 since the 2.4 GHz band has become overcrowded and full of signals. In a crowded wireless environment signals begin to collide which than needs them to be resent slowing down a network. The new 802.11ac protocol introduced in late 2013 is the fastest WiFi protocol available. This gives it a huge advantage over Wireless-N the last WiFi protocol introduced, which can move data up-to 150/300 Mbps. 802.11ac only works in the 5 GHz band which means range would be sacrificed for faster speeds. Wireless-N is the only protocol that can work in both bands 2.4GHz and 5GHz. 802.11ac USB adapters with drivers written for the Linux have been slow to come about. There has been some good Linux compatibility with the Realtek RTL8812AU chipset and 802.11ac. Being able to pen test with Linux is one of the benefits of using it. Unfortunately not all USB adapter can pen test and go into monitor mode. The good news is there are some that can be used to pen test click here for our list of Linux Pen Testing USB Adapters. The most popular are the Alfa AWUSO36NH and the TP-LINK TL-WN722N. Is there a wireless adapter for Linux Mint (cinnamon), that doesn’t first need the computer connected to a wired connection? I know there are plenty for Windows computers. With the Atheros chipset you’ll be limited to 7 connected clients. That’s why I switched to RTL8812AU and I’m very happy with it. Many thanks for publishing this list. It was very helpful to me in focusing my research and helping me to make a buying decision. Thank you, I ordered the Alpha Long range based on your recommendations — via the applied link. Thanks. Finding out that even if a Linux distro detects your internal card. That doesn’t mean its going to work as well as in Windows. Let’s face it, most drivers for Linux are imitations created to emulate proprietary drivers. Sometimes they work well, sometimes not so much. Nice to see some USB wireless options because without wireless on a laptop its really not worth having linux. One laptop I have simply won’t work well with linux, spent hours trying to tweak the wireless driver. Sadly, I just went back to Windows. Trouble with USB wireless is the obvious, you loose a usb port and you have a dongle hanging off the side of your laptop. Of course some PC makers lock hardware to bios so your choices of hardware is limited to what that model can use. Much of my linux use falls into older desktop PC’s trying to get a couple more years out of them. Linux generally runs very well on older hardware. Think Penguin should be on top of this list as it’s made specifically for Linux distributions. I bought a long range one a few weeks ago and it’s the best I’ve had in 12 years. Looking for the best dongle with an RF coaxial connector for attaching to an external outdoor 2.4ghz omni array, and to my AspireONE Netbook running Debian Squeeze as a WLAN Server in my RV. affter having upgraded my previous Wheezy to Jessie, I want to ask, WHY are you running Squeeze? I am running a 10 year old desktop. it was one of the very few available 64 bit AMDs at the time. I also had to have it custom ordered and beg to get a 64 bit version of winDOHs for it. (Yes, at that point in time I knew nothing of Linux or anything other than the commodore, Macintosh,Windows (MS)DOS, and proDOS I had used, sadly. My friend. What Ubuntu version are you at? The LTS is Long Term Support and is easy to upgrade within the same LTS. Upgrading one LTS to a newer is also possible. Hi, Do you know something about D-Link DWA-192 Is it compatible with linux? I found https://github.com/sbosshardt/rtl8814AU so I think yes, but I’m not sure. Maybe you tested it? This has been great, thanks for the simple and straightforward write-up. Been using Ubuntu since fiesty fawn with the same machine. I love it… Untill I have to update. Every time I update I lose wireless and 50 / 50 I might lose support for graphics. It’s not like I have a high end system either, in fact, quite the opposite. Thing is, I like the os (obviously) but it’s getting in its own way. Hoping that the right hardware combo alleviates this a bit. Unfortunately, true. One guy posts he spent a couple of hours and gave up? Lightweight! I’ve been bashing my brains on Linux as a desktop for years. What can you do? You gonna let MS rip your life to shreds? I’m trying to save mine now by dog-paddling in the ridiculous mess of complexity and inconvenience of Linux on the Desktop rather than drowning in the ridiculous mess of complexity, inconvenience – and malevolence, that Windows has become…. I couldn’t agree more. Windows updates keep blowing up my computer. Downloaded Linux Mint. Elegant and professional, but no wifi. I’m not talking no driver, I’m talking no wireless capability period! I love Linux Lite, but not very powerful. I download Mint and can’t use it. Why don’t I just buy a rubick’s cube? It would be less frustrating than this! I love the guys that develop the free OS and I thank them. I’ll even give them a donation if I ever get this damn thing to work! Is TP-link : TL-WN823N compatible with kali linux for airmon-ng and other Penetration Testing tools? How can I turn on monitor mode for TP-LINK Archer T4U? The posted drivers are useless. The T4U can not go into monitor mode. The TP-LINK TL-WN722N can and is a popular option for Pen testing. Alfa also makes many good monitor mode compatible units. Can I turn on monitor mode for TP-LINK Archer T4UH?